Today is Wallplay’s last day on the Lower East Side before it has to vacate the premises at 118 Orchard Street, and if you’ll remember, they’re throwing one hell of a farewell party to commemorate their pop-up space, which during its short history added some serious color to the Lower East Side landscape. The best part? Everyone’s invited. Whimsical baked goods? Check. Free drinks? Check. A massive interactive mural with interchangeable bits and pieces you can move around like a giant adult version of a sticker book? Check! Wallplay may not be around much longer to satisfy your LES pop-up needs, but there are plenty of other artist-brand collabs waiting to fill the void. Case in point: Extra Butter. 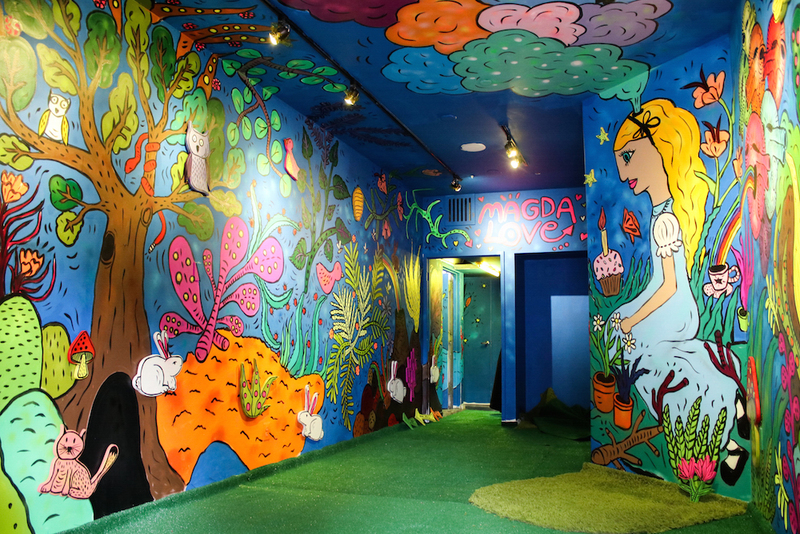 Tonight, the Lower East Side sneaker boutique will be hosting a pop-up event with Argentine-born artist Magda LOVE, who has transformed Extra Butter’s space into a walk-in interactive mural and shop selling LOVE’s paintings, custom stickers, and even furniture designed by the artist. If you’ve been hanging around the Lower East Side lately, you may have been temporarily blinded by a bright cobalt-blue building on the corner of Orchard Street and Delancey. The vivid splash of color was a collaboration between the skate shop RipNDip and Wallplay, a creative agency that brings together artists and brands to develop site-specific installations. RipNDip’s pop-up skate shop was just one in a long series of projects that took over the space at 118 Orchard Street (remember Tim & Eric’s cult ceremony?). But now, with the building set to be demolished, Wallplay is having one last hurrah and inviting everyone to trash the place. Last time we bumped in photographer Anna Bloda, she was trying on clothes. This time, she’s stripping them off. Bloda is baring all for a group exhibit that opens tonight at Rox gallery — and judging from the flyer for “POLISH,” she’s not the only one getting naked.